Happy Yom Haazmaut (Israeli Independence Day) from Jerusalem. In honor of the holiday I’m publishing a list (and accompanying chart) of Hebrew and English family and genealogy terms. For the impatient, the list of terms is at the bottom of this post. Keep in mind one thing when looking at the list – it’s a first draft and I expect it to change based on input from others and the comments made below. The list is not a dictate, it’s a discussion. The following is the background on why I’ve put this together, what the issues were, and where I found the information. 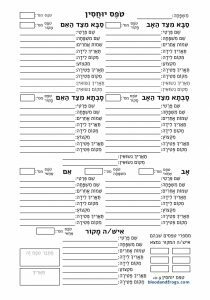 Recently I’ve been thinking about creating Hebrew versions of my B&F Forms System. 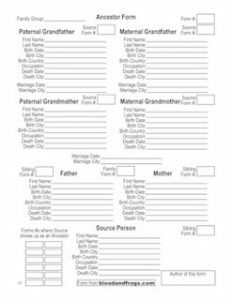 As I’ve mentioned before, my collection of genealogy forms are designed to work together, connecting in ways that are fairly unique. I don’t know how many people have used my forms, as there’s no way to track their usage when they’re shared. I do know, however, that my forms have been downloaded over 40,000 times from this web site, and have been used by schools and other organizations, so I can only assume the number of people who have used them is higher. I’ve long wanted to translate the forms into Hebrew, but for many reasons, many of them technical such as no longer having the software I used to create the original forms, I’ve never been able to do it. Recently I’ve been looking into the idea of finally translating the forms, so I’ve been doing research to insure all the terms I use are correct. In my research I found no extensive glossary of family and genealogy terms in Hebrew, although there were many partial lists. That led me to start putting together my own, which I am presenting below. I’d like people to think of this as a beta version, however, as I’m not 100% certain on all the terms, as I’ll explain in detail. I also know that there are more terms to add in the future. This is the beginning of what I imagine will be a long discussion. When I speak to people who learned English as a second language, invariably they describe it as a difficult language to learn. Primarily the problem people have with English is that there are so many exceptions to the rules, that it almost seems like there are no rules. Hebrew has a different problem, although it certainly has its own problem with exceptions. Hebrew, of course, has been in use for thousands of years. As a spoken language, however, it has a large gap in its history. Even two thousand years ago, many Jews spoke Aramaic or Greek in daily life, and reserved Hebrew for religious rites and scholarship. That’s not so different from the nearly thousand years that Yiddish was the primary spoken language of Ashkenazi Jews in Europe, or Ladino was used by Sephardic Jews after the expulsion from Spain in 1492. However you look at it, until the foundation of the state of Israel, it had been well over two thousand years since Hebrew had been widely spoken by people as their native language. One of the most amazing achievements of the Zionist movement in the late 19th and early 20th centuries, which some would describe as miraculous, was the revival of Hebrew as a spoken language. This is the only time in history that a language with no native speakers at the time was turned into a national language with millions of speakers. 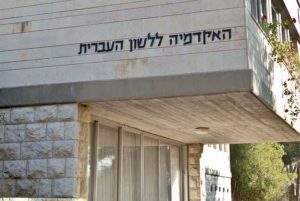 That process was started by individuals, most famously Eliezer Ben Yehuda, and continued by committee, and eventually by the Academy of the Hebrew Language, which was established in 1953 and tasked by the Israeli government to direct the development of the language. With all of that, modern Hebrew remains a language in flux. Modern Hebrew starts with biblical Hebrew, but shows influences going back to Aramaic and Greek, on to Yiddish and Ladino, and more recent influences such as English and Arabic. While there is an Academy, that doesn’t mean people speak strictly by its rules. Certainly that is not the case. One good example is the use of the words Saba (סַבָּא) and Savta (סָבְתָא) for grandfather and grandmother. These words are universally used, but strictly speaking, not the proper Hebrew terms (they are in fact Aramaic, not Hebrew). The correct terms are actually Sav (סָב) and Sava (סָבָה), but I’ve never heard anyone use those terms. Additionally the correct term for grandmother (Sava) sounds a lot like the actually used term for grandfather (Saba). Remember that in Hebrew B and V are the same letter (the letter bet ב, B with a dot in the middle and V without). Another example is that the offical term for great-grandfather is Av Shileish (אָב שִׁלֵּשׁ), while the universally used term is Saba Raba (סַבָּא רַבָּא). Moreover, while the correct female version of this would be Savta Rabta (סָבְתָא רַבְּתָא), it seems many people say Savta Raba (סָבְתָא רַבָּא). Another problem with figuring out the correct terms to use is the fact that Hebrew is a gendered language. There are no generic terms such as ‘cousin’ or ‘grandparent’. At best, one would use the male version of the word when lacking gender specificity, but that can lead to some confusion. In another example of official words versus actual usage, the official word for cousin is Dodan (דּוֹדָן) in the masculine, and Dodanit (דּוֹדָנִית) in the feminine. Many people, however, people use the terms Ben Dode (בֶּן דּוֹד) and Bat Dode (בַּת דּוֹד) instead. Literally those terms mean Son of Uncle and Daughter of Uncle. You could also say בֶּן דוֹדָה (Son of Aunt) or בַּת דוֹדָה (Daughter of Aunt), and some people do this, but some people also fall back on just using דּוֹד generically. In any of those four cases, however, the term literally refers to one’s first cousin (the child of your aunt or uncle). As such there essentially is no term for first cousin in Hebrew. You could say בֶּן דּוֹד רִאשׁוֹן if you wanted to be specific, but it’s not very common. In my experience Israelis describe the relationships they are trying to convey, and don’t necessarily use the ‘correct’ terms. One example which took me some time to figure out was what to call a great-uncle or great-aunt. When I asked my neighbor, she said she would describe them as the brother or sister of her grandparent. When I told her I had come across the terms Dod Raba (דּוֹד רַבָּא) and Doda Rabta (דּוֹדָה רַבְּתָא) she had clearly never heard of them. If someone were to use these terms in speaking, I suspect that the female would end up being Doda Raba, similar to how Savta Ravta is normally used as Savta Raba. Interestingly the Academy shows these terms (not דּוֹדָה רַבָּא which is said, but not grammatically correct), but also Dod Gadol (דּוֹד גָּדוֹל) and Doda Gadola (דּוֹדָה גְּדוֹלָה), which may come from the English terms great-uncle and great-aunt (although Raba also means great). 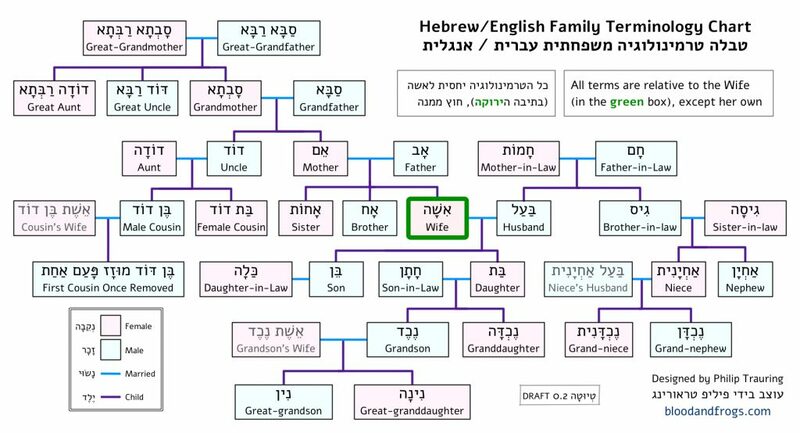 Another interesting example is that Hebrew, unlike English, has specific words for great-grandson and great-granddaughter. While the terms for grandson and granddaughter are Neched (נֶכֶד) and Nechda (נֶכְדָּה) respectively, the terms for great-grandson and great-granddaughter are Nin (נִין) and Nina (נִינָה). How would you say great-great-grandson? Officially the term is Khimaish (חִמֵּשׁ), which comes from the Hebrew word for five, but in practice I think the real usage is Ben Nin (בֶּן נִין), which means ‘son of great-grandson’. Also, like the word for cousin, which means ‘son of uncle’, if you wanted to say great-great-granddaughter, you would say Bat Nin (בַּת נִין) which means ‘daughter of great-grandson’ even if the girl in question was the daughter of one’s great-granddaughter (although you could say בַּת נִינָה if you wanted to). Choosing the terms to use, therefore, is a bit complicated. One thinks of the lexicographical debates in the past over descriptive versus prescriptive definitions. I tend towards the descriptive approach, as if something isn’t being used in real life, it’s not that useful. When there are terms that are not widely used as all, I tried to stick to the official terms, unless they seemed out of the pattern of other similar terms. I welcome discussion of these terms in the comments below. I imagine some people will disagree with the choices I have made. To research these terms I looked at various dictionaries (including Morfix and Milog), but also online forums where these terms were discussed, articles that discussed the terms, as well as talking with native Hebrew speakers to understand what terms they used in the real world. Some of the sources include the Academy of the Hebrew Language’s Term Database and articles there as well (עברית לכל המשפחה, איך ייקראו בן הנין ואחי הסב?, חם וחמות, חותן וחותנת, פרשת וירא – נִין), several articles across different sites (1, 2, 3, 4), and the Tapuz Forum (some example threads include: 1, 2, 3, 4, 5, 6, 7, 8). That last Tapuz link was amusingly a discussion of families in Harry Potter. After piecing together most of my list, I found a cousin chart which confirms most of what I had determined for cousins, laying it out very nicely. One problem with the system used in the chart (going from בֶּן נִין to נֶכֶד נִין to נִין נִין to בֶּן נִין נִין) is that it becomes hard to calculate the further you go. I agree that’s the general consensus on what people would do, but I wish there was a simpler way to do it. It seems there is no set method of laying out these relationships. Another problem is the term for ‘removed’ which I’ll discuss below. One site that was useful in finding real world usage of these terms is Reverso Context, which for the term great-great-grandson, includes the following real-world examples: נֶכֶד הריבע, נֶכֶד שֶׁל נֶכֶד, and נֶכֶד רַבָּא רַבָּא. In English, those would be grandson of grandson, grandson the fourth, and great-great-grandson. Interestingly, none of the examples include בֶּן נִין from the chart mentioned above. Keep in mind when looking at Reverso Context that not all the translations are accurate. They are for the most part taken from an interesting source – a public database of movie sub-titles. Those sub-title files are likely not professionally translated but done by film enthusisats looking to share translations of movies into their own language. Transcriptions are done by everyday people and not professionals, however, that can actually be beneficial when trying to analyze regular usage in a non-academic setting. Another example from Reverso Context is for the term great-great-grandfather, which is kind of the reverse of the above. Here we have the expected סָבָּא רַבָּא רַבָּא, but also סָבָּא שֶׁל הַסָבָּא ,סָבָּא רַבָּא נֶהְדָר, and סָבָּא ריבעה. One more example where this gives some insight is how to explain cousins of different generations. In English we say first cousin twice removed, or third cousin once removed, etc. In the chart mentioned earlier, they use the term ‘מוּזָח’ which means moved, so בֶּן דּוֹד שְׁלִישִׁי מוּזָח פָּעַם אַחַת is third cousin moved one time. In Reverso Context, a common usage is הוּסַר, which means to remove. This could simply be because there is no established terminology here, and these examples are people who are simply translating the English term. Other terms used include מֶדּוֹר which means from generation (i.e. בֶּן דּוֹד מֶדּוֹר שְׁלִישִׁי for first cousin from the third generation) and מַדְרֵגָה which means level (ie. בֶּן הַדּוֹד הַרִאשׁוֹן מַדְרֵגָה שְׁנִיָּיה for first cousin level two). This is confusing since some people say בֶּן דּוֹד מַדְרֵגָה שְׁנִיָּיה to mean second cousin. For that reason I would avoid using מַדְרֵגָה in this case. At this point it seems that whoever is using a word for this concept is making it up as they go. When discussing this issue with a friend, they suggested a better word might be מוזז, which can mean removed or shifted, and now I have about five candidates. There is no ‘correct’ term, at least in the sense of being approved by the Academy of the Hebrew Language. One way to get such terms approved is probably to get them put to use in the real world. For the time being I’m going with מוזז, and I welcome discussion in the comments below on what you think of this term, and what you use to describe cousins of different generations. If you have real-world examples, particularly published in books or news media, that would be helpful. Lastly, the goal for this list, and the accompanying chart at the top of the page, is to help family researchers who speak English to figure out what terms to use in Hebrew, and also for Hebrew speakers to figure out what terms to use in English. I’m hoping this will help everyone communicate better, and with a bit more precision, when conversing with family or archives in English speaking countries and in Israel. For those terms that are not well known, perhaps this list will help them receive some use, and for those those concepts that did not have established terms, hopefully this list will help spur on the approval of such terms. Below is the full list of terms. This is a first draft, so if you see an error, please post it in the comments below. I will correct the list and update it (and the chart at the top) over time. I’ve strived to find the middle ground between what is really used in Hebrew, and what is ‘correct’ according to the academy. Usually the academy recognizes other uses and lists them, even if they’re not preferred, so I’m only switching their order of preference. For the transliterations, note that I use kh to represent the letter khet (ח), which represents a sound that is not used in English. While you can very roughly approximate the pronunciation of words that begin with kh by dropping the k (i.e. haam instead of khaam), that doesn’t work when the letter is at the end of the word (i.e. ah instead of akh). In the table below columns are sortable, and you can search a term as well in the search box at the top. If you think there are terms that should be added (and I’m sure there are) please post your idea to the comments below. I would think “Saba” needs to have a patach as its first vowel, not a kamatz; otherwise, the bet would be pronounced vet after a tenuah gedolah. You’re right, thanks. I’ve fixed it. Also, while we don’t usually say סב (preferring סבא), we do use it in the possessive – סבי. Thank you. Your articles look very interesting, I will definitely take a look. Official documents don’t use Abba or Sabba, these are referred to as Av and Sav. The Hebrew term for a grandmother (although rarely used) is Sava סָבָה. I mention this in the article, and in fact I use Av for father, but chose Saba for grandfather since it is almost universally used by everyday people. Using Sav/Sava for grandfather/grandmother would just be confusing. Added a bunch of terms culled from Israeli government forms (amazingly these are not consistent in their use of specific terms and grammar), particularly relating to birth and death. Now over 150 terms. Fixed a few minor consistency issues. In the cousins’ chart they use the term “Muzach” מוזח and not “muzaz” מוזז for “removed”. I wonder what is the proper term. The short answer is that there is no ‘proper’ term. Establishing terms like this is part of what I am hoping the publishing of this list will accomplish. I discuss this specific term in the article above the list (and several options I’ve seen used). I’ve also brought up this term in the גנאולוגיה בישראל Facebook group (https://www.facebook.com/groups/1703463273233708/permalink/2072128046367227/) and in the Tapuz forum (http://www.tapuz.co.il/forums/viewmsg/325/183159324/משפחה/שורשים_משפחתיים). The best thing we can do is discuss it, use it, and see what gels with people.